Your websites should not only be responsive for computers, they need to be perfectly suitable for mobile devices. This is simply due to the rising prevalence of mobile devices as a method to access the internet. If Google notices that people are having problems with viewing your website on mobile devices, it will simply drop your rankings. 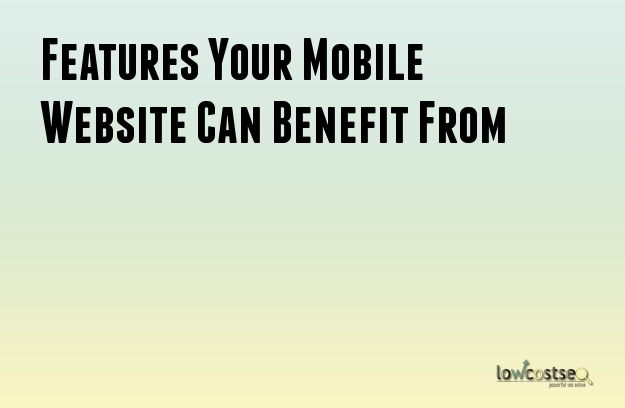 However, it can be tricky to determine which features are required by mobile websites. Here is a list of items you should consider implementing in your website to make them friendlier to mobile devices. In most cases, when people are looking for specific services or business, they would prefer to contact them first rather than making a visit to the physical location. This can be common phenomenon when people are searching for local businesses. Therefore, you need to ensure that there are contact buttons on your website. These buttons help the user place a call directly to your business. You can add a button for emails or text messaging as well. Maps are essential for your mobile websites. People usually search for local businesses on their mobile devices. By placing map functionality on the website it becomes easier for your customers to locate your place of business. You can attach a widget which allows your visitors to get the directions to the location. It will be of more use. You can enable functionalities on the map that gives a complete list of steps required to reach your business location. Contact forms allow the visitors to your mobile website to ask you any questions they may have. After all, they can have queries regarding your products or services. By making it easier for the customer to ask questions, you can increase the leads your business garners. Your contact forms should not be highly detailed. People will find it irritating to enter too much information on their mobile devices. Ask for only the basic and the most necessary details. This will include name, email address, type of queries, comments and so on. Displaying too much of information on your website can pose a problem for those who will view it on their smartphones. Due to the smaller size of the screen, it becomes difficult for them to browse through all the content. However, you can easily use collapsible content and sliders to make the information more accessible. You can put images and content using this method to conserve space and enhance readability. Navigation is an important issue when creating websites for mobile devices. Users should be able to perform the basic and important navigational actions without any difficulty. Essential parts of your website should be easily accessible from any webpage. Instead of creating a separate website tailored for mobile users, you can modify your existing website.